Stian is an award-winning designer with eight years of experience with both large and small projects in the corporate and start-up industry. Gamification is more than adding game elements such as badges, points, and leaderboards to a product. It’s a careful study of what specifically motivates a person to use and enjoy an application. Why do people commit to spending hours writing articles on Wikipedia for free? Why is Facebook so much more successful than Google+ and LinkedIn? 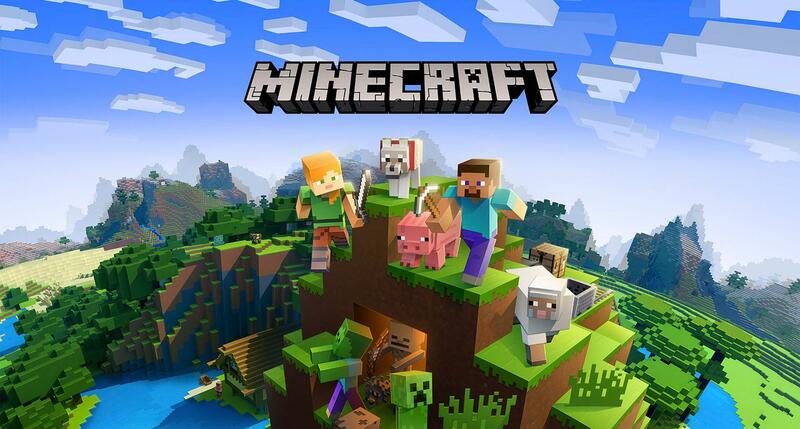 Given its simple graphics and gameplay, why is Minecraft such a highly played game? Why do people still play ancient games such as Chess and Starcraft 1 while other, seemingly better games fade after only a few months? 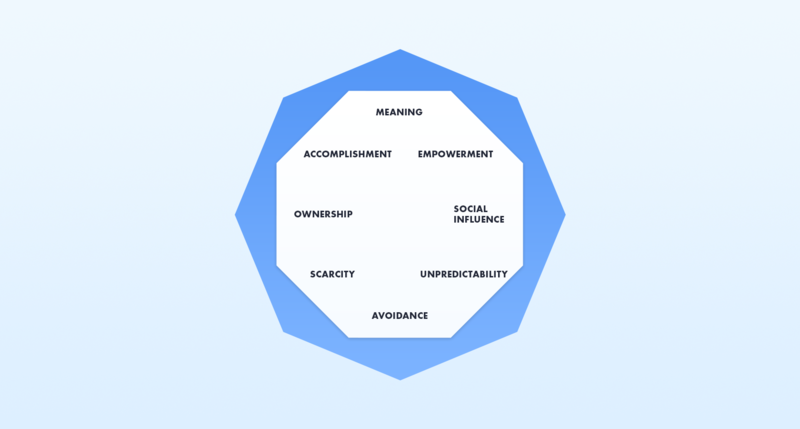 The Octalysis framework is a gamification framework that answers these questions, explaining in detail why a product is enjoyable or tedious. Let’s take a closer look. People do things for a reason. Understanding why they do what they do is crucial for creating a successful product. 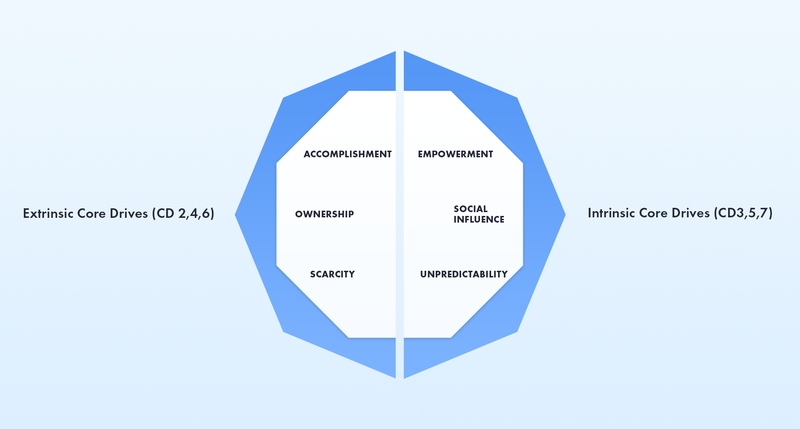 Yu-Kai Chou spent ten years designing the Octalysis framework and identified eight core drives that exist within humans and motivate us to engage in activities. If an application or experience has none of these core drives present, a person has zero motivation to engage. Therefore, it’s important to understand why core drives motivate people and how to apply them. The reason why people spend hours contributing to Wikipedia is because of Core Drive 1. Together, they embark on the epic journey of making the world a better place by documenting and spreading knowledge. Core Drive 2 involves the internal drive of making progress, developing skills, overcoming challenges, and feeling a sense of accomplishment. An awareness of struggle is essential to Core Drive 2, as a badge or a trophy without a challenge is not meaningful and can even demotivate the user. Due to the one-way nature of Twitter communication, people view gaining followers as an achievement. Since no one can be forced to follow anyone else, the only way to increase followers is by creating interesting content. This is a challenge that offers a true sense of accomplishment when overcome. In the early days of LinkedIn, people rarely completed their user profiles due to poor visual feedback of the progress made (insufficient Core Drive 2). However, after implementing a profile progress bar, LinkedIn increased their completion ratio by a staggering 60%. Empowerment of creativity and feedback relates to when users are engaged in a creative process. This involves giving users the freedom to express their creativity, get feedback, and make adjustments. Minecraft is a prime example of Core Drive 3 because users are given the ability to express creativity by using simple building blocks to craft complex structures and make adjustments as they go. 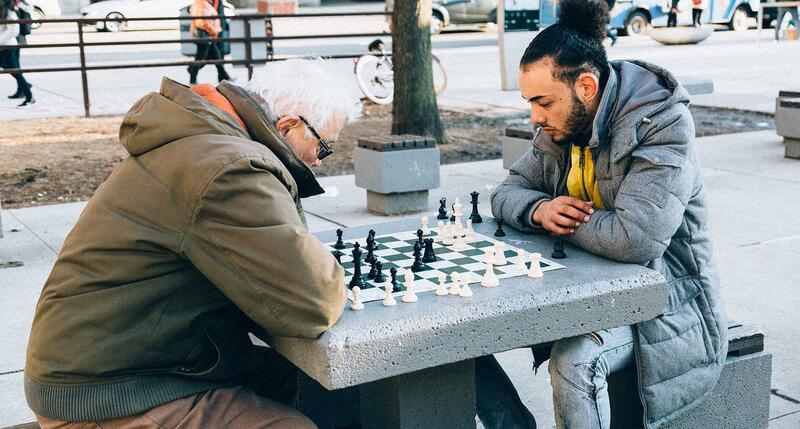 Chess has stood the test of time due to its focus on Core Drive 3. It’s a uniquely creative game that allows players to shape highly personal playing styles. In fact, there are approximately 140,100,033 possible positions to play in a game of chess. In Core Drive 4, users are motivated because they feel like they own something. When players feel ownership, they want to improve, personalize, protect, and get more. In the real world, this is what drives us to make money, but it can also be tied to elements with sentimental value such as collecting baseball cards or customizing a Dropbox folder. 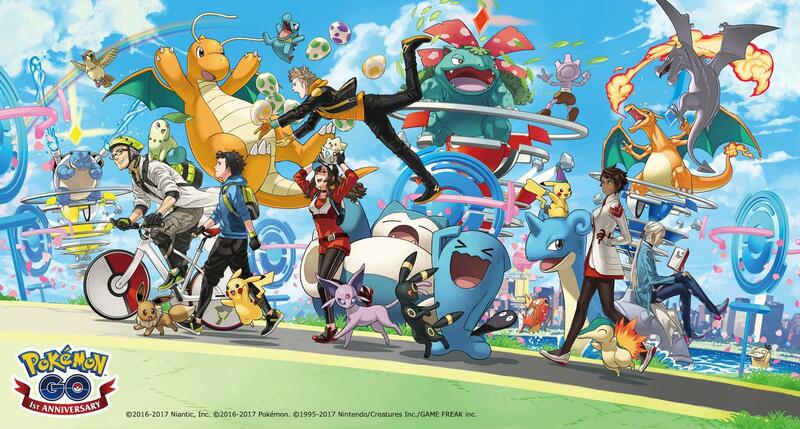 Pokémon focuses heavily on a Core Drive 4 concept called “collection set.” Each Pokémon captured is added to a collection and gives users a sense of ownership. Once players catch a few Pokémon, they gotta catch ‘em all, and the hunt continues. 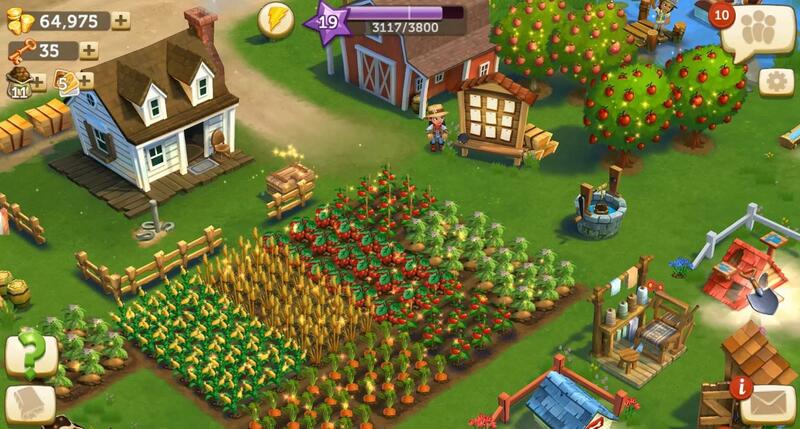 Farmville makes players constantly strive to increase the value of their assets by developing land. This includes seeking higher crop yields and improving the quantity and quality of livestock, both of which are motivated by the sense of ownership players have for their digital farms. Social influence is related to activities inspired by what other people do, think, or say—basically, what every social media platform is built on. Relatedness centers on emotional associations and feelings of nostalgia such as meeting an old friend or finding a product that brings back memories of childhood. 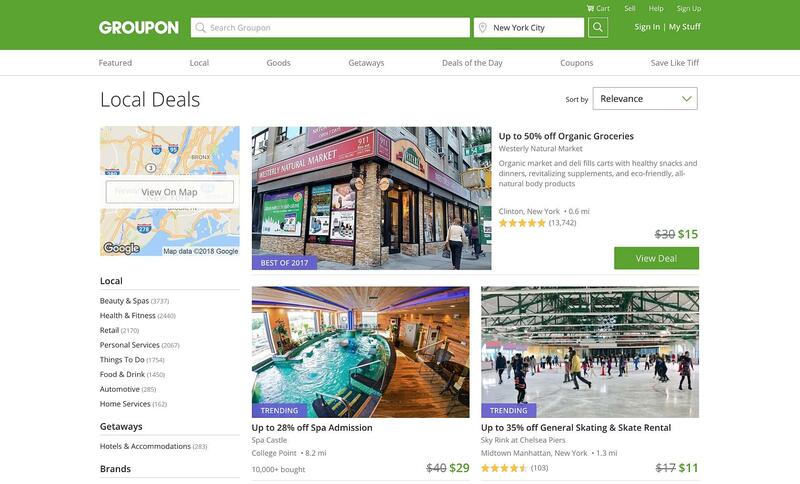 Groupon was one of the first companies to turn an eCommerce platform into a social event. If enough people sign up to buy a particular item, the reward is a substantial discount. Happy users then invite other people to join and share the benefits (social influence). Appealing to an emotional connection (relatedness) with other users builds a sense of trust and lowers the threshold to buy something. Scarcity and impatience motivate us because we are either unable to obtain something immediately or because there is great difficulty in obtaining it. If you can’t have it, you want it. The existence of the sale is scarce, and people are motivated to act with a sense of urgency. In its early days, Facebook was only available to Harvard students. This caused impatience among other university students who wanted to access the platform. Once Facebook was finally made available to other universities, people flooded in due to the exclusivity (scarcity) of it. People are curious beings. We have no foolproof way of predicting the future, yet we’re always thinking about what will happen next. Unpredictability is a powerful force in motivating people to keep pressing on until they have clarified the unknown. We’re driven by the chase. Gambling is fueled by the feeling of unpredictability. Being able to pull a lever and not knowing the result creates a thrilling experience. A good television series will add a cliffhanger at the end of every episode to create a sense of anticipation for the next. This appeals to the audience’s curiosity and desire to clarify the unknown. Avoidance and loss motivate through the fear of losing something or having an undesirable event occur. Marketing campaigns often target Core Drive 8 with tactics like, “If you don’t sign up now, you’ll lose this chance forever.” In fact, psychology studies suggest that we are more likely to act based on avoiding loss rather than making gains. 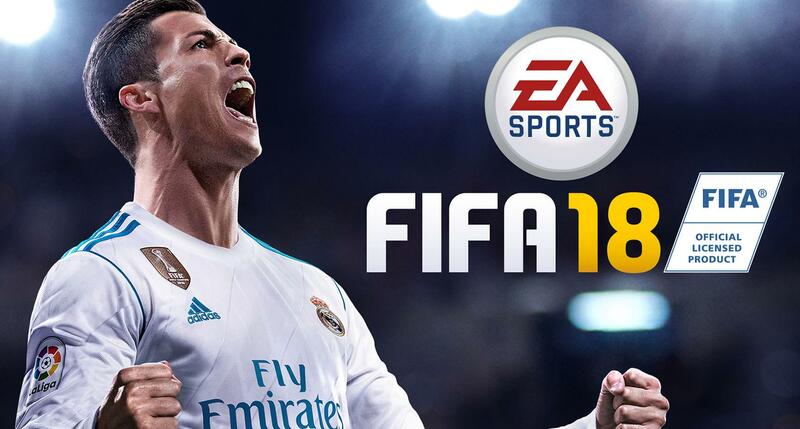 FIFA 18 has a concept called “Player of the Month,” where a famous footballer is available for purchase, but only for a limited time. This motivates FIFA players to act and buy in order to avoid losing out on a good opportunity. Black Friday is a great example of how limited opportunity can motivate people to act with an extreme sense of urgency. Once a year, on the Friday after Thanksgiving in the United States, products are priced a lot cheaper, and people flock to stores to avoid losing out on sweet deals. One way to apply the Octalysis framework is by using it to analyze a product, identifying which core drives are in place and how they are utilized. In this way, we can clearly see what motivates people to use a product. As seen in the illustration, Facebook utilizes most core drives, hence its success. However, it lacks CD1—epic meaning and calling. This results in people feeling like Facebook is a waste of time, which is why we hear their relief when users quit the platform. The relief comes not because people don’t enjoy Facebook, but because it’s not worth their time. As of late, Facebook has been trying to combat this problem by adding a bigger emphasis on Core Drive 1 and allowing users to donate money to good causes and participate in life-changing events. If you run the same Octalysis analysis on Google+ and LinkedIn, you’ll notice why they did not achieve levels of success that rival Facebook. Google+ is largely inactive, and LinkedIn lacks social interaction between users. Google+ primarily failed due to poorly executed Core Drive 2 (development and accomplishment). The onboarding phase was difficult, making users feel inadequate and unaccomplished (CD2). 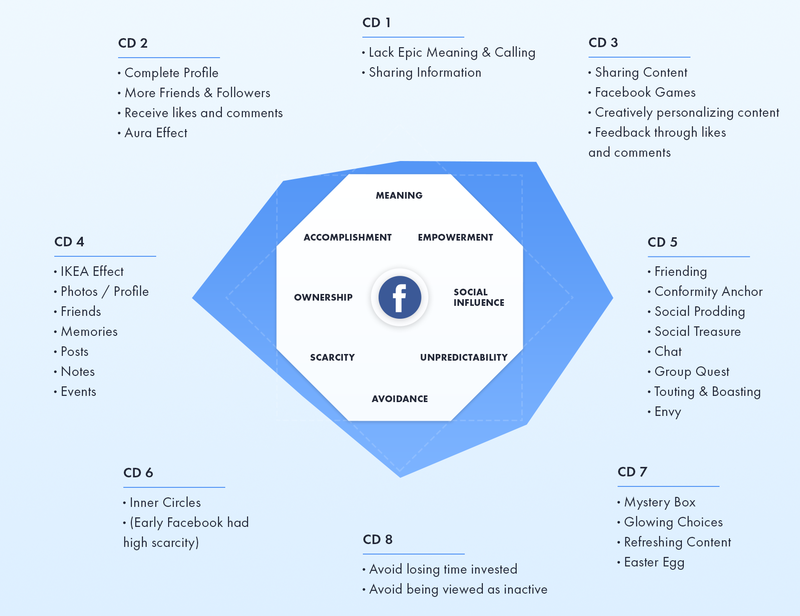 This led to users losing motivation and quitting the platform before they could engage in the community and use their creativity to contribute content (CD3 and CD5). LinkedIn lacks the core drive that enables people to be creative (CD3). Users are hesitant to share their personal life on LinkedIn and instead look to portray themselves in a manner worthy of landing a new job or client. This severely limits a willingness to create and share content. Octalysis is designed as an octagon for a reason. In this framework, we have a concept called white hat and black hat core drives. These drives divide the top from the bottom, as seen in the illustration below. White hat core drives make the user feel powerful and in control, but they fail to prompt a sense of urgency. Black hat core drives make people feel urgent and called to action, but in the long run, they discourage users by making them feel like they lack control of their behavior. Neither white hat nor black hat core drives are inherently good or bad. Each serves its own purpose and balances the other. 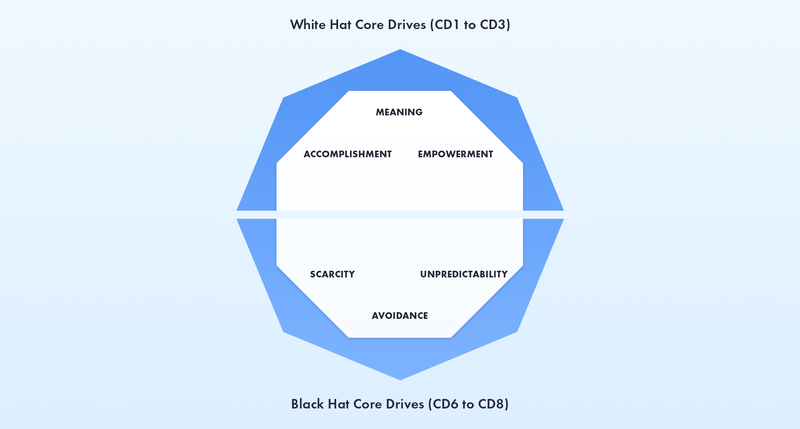 However, for long-term product engagements, it’s important to focus on white hat core drives. Minecraft has achieved long-term engagement by allowing players to express their creativity (CD3). However, this creative freedom is given against a backdrop of scenarios that demand urgency (black hat). Consider the scarcity of safe places to make camp in Minecraft’s first night of survival mode, not to mention the constant threat of being attacked by zombies and spiders. In the past, Zynga games applied black hat concepts effectively. For instance, in Farmville, a player’s crops would die if they weren’t tended to daily (Core Drive 8), motivating players to regularly log in. However, games created by Zynga are a clear example of what happens when white hat and black hat aren’t properly balanced. People get burned out by the ongoing threat, leading them to quit the experience (too much emphasis on black hat). Farmville could be improved and gain more long-term (endgame) users if its designers would find more opportunities for players to express creativity. If you’re familiar with the game, you may have noticed the emergence of user-generated farm designs with an artistic flair, a clear sign that the user base desires more creative freedom. Understanding the balance between core drives and the potential for user burnout is crucial in developing a sustainable application. For more information, check out White Hat vs Black Hat. The Octalysis framework is also divided into left and right sections. On the left side, we find extrinsic motivation, where users are compelled to perform a behavior to earn a reward or avoid punishment. Simply put, it is the reward that motivates, not the act itself. On the right, we have intrinsic motivation, which involves engaging in a behavior because it is personally rewarding. Essentially, this means performing an activity for its own sake rather than the desire to get a reward. One reason is that extrinsic motivation can kill intrinsic motivation. Consider a concept artist who draws as a hobby and then gets hired to draw professionally. If the salary they receive is lower than the value they feel their work is worth, it will eventually diminish any motivation to keep drawing. Interestingly, this particular artist drew for free before getting the offer to be paid! It’s also important to be wary of using extrinsic motivation in the discovery phase of a product. This phase is the first point of contact a user has with a product. Early on, users typically don’t have a feeling of ownership over an experience, so it’s often better to focus on intrinsic motivation by appealing to curiosity or the desire to participate in something beneficial. Think back to the examples discussed earlier. From leading eCommerce platforms to popular games, there are surefire patterns that run through all successful products and experiences. Take industry giants Amazon and eBay, both of which drive sales by appealing to black hat core drives. Why do they do this? To instill shoppers with a sense of urgency. Predictably, it works. Or, consider chess and Minecraft, two well-loved games that appear to have little in common. However, both have proven capable of generating long term engagement due to a focus on white hat core drives and the empowerment of creativity. Understanding the concept of motivation is paramount in developing consistently good user experiences. The behavior influencing concepts and human psychology behind gamification are available to us as designers. They help us grasp why something works or why it doesn’t. Correctly applying core drives will add meaning and value to the products we make. In turn, our users—the people we create for—will enjoy a fun, engaging, and meaningful experience. Can I appeal to a greater cause of some sort, like narrating an epic quest? Can I create an opportunity for the user to help other people? How do I make my users feel accomplished? Can I add an element of challenge in order to make it fun and rewarding? Is there an opportunity to give the user multiple choices to reach the same goal? Can I give my users boosters, items, or skills to personalize and use? Can we instill a sense of ownership or give users something to protect? Is there an opportunity to add a form of communication between users? Can we remove a sense of abundance to promote scarcity? Can we motivate the user with unknown rewards? (mystery box, Easter eggs), etc. Can we create limited opportunities that disappear if users don’t act soon? Is there a way to appeal to future reward if they keep using the product? The Octalysis framework is a gamification framework that explains in detail why a product is enjoyable or tedious. The primary focus of Octalysis is optimizing human motivation. 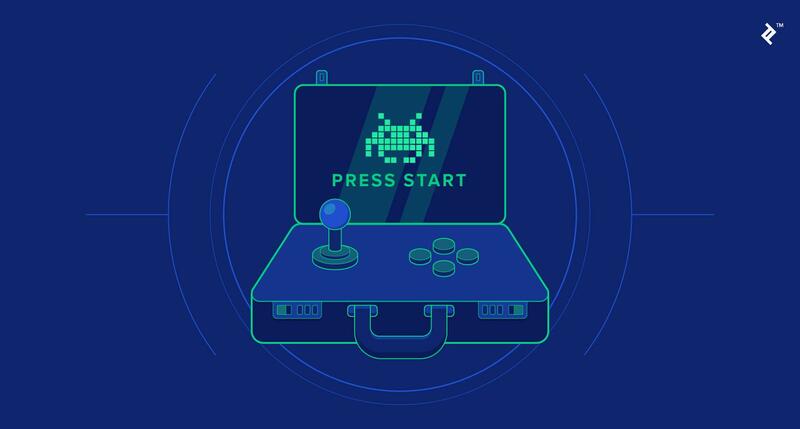 A gamification strategy is a plan for motivating users throughout their entire journey with a product or experience. What is meant by user-centered design? User-centered design is focused on meeting users’ needs and producing products and experiences that are both functional and accessible. It includes areas of concentration such as ergonomics, human factors, and usability engineering. Stian is an award-winning designer with eight years of experience in the corporate and start-up industry. Working with both large and small-scale projects in SaaS. He specializes in UX and UI design as well as having experience in animation and VFX. Especially oriented around behavioral science also known as gamification. Some of the clients he's worked with include Statoil, Westcon, Baikingu, and InfoGym.